c) The people's donation of the materials for the Sanctuary (Exodus 35) and the Sanctuary's construction, erection and sanctification (Exodus 36-40; these comprise the sections of Vayak'hel and Pekudei). In keeping with the rule that "There is no earlier and later in Torah" (i.e., the Torah does not necessarily relate events in the order in which they occurred), the biblical commentaries differ as to the chronology of these events. All told, there are no fewer than three different versions of the time-frame of the Mishkan's making vis-a-vis the making of the Golden Calf. 1) On Sivan 6 (or 7, according to Rabbi Yossi), G‑d revealed Himself to all of Israel and proclaimed the Ten Commandments; on the following day, Moses ascended Mount Sinai to receive the Torah from G‑d. 2) Forty days later, on Tammuz 16, the people made the Golden Calf, and rose early the next morning to worship it. On Tammuz 17 Moses descended from the mountain carrying the Tablets of the Testimony; upon seeing the people dancing around their idol, he smashes the Tablets at the foot of the mountain. 3) On Tammuz 19, Moses ascended Mount Sinai for a second 40 days to plead for forgiveness on Israel's behalf. At the end of this period, G‑d tells him to carve two new tablets, upon which He will inscribe the Ten Commandments, to replace the broken tablets. 4) On the 1st of Elul, Moses ascended the mountain with the tablets he carved for a third forty days, which concluded on the 10th of Tishei (Yom Kippur). On that day, Moses received the Second Tablet from G‑d and G‑d expressed His full forgiveness of Israel's sin. 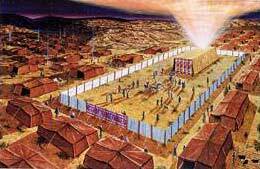 5) The construction of the Mishkan's components and vessels was completed 2 1/2 months later, on the 25th of Kislev (the first day of Chanukah). But the Mishkan was not set up until more than three months after that, on the 1st of Nissan (preceded by a week of "initiation," Adar 23-29). The above is derived by the Talmud from the Torah's account. The point of contention between the commentaries concerns G‑d's instructions regarding the Mishkan and the people's donation of its materials. Nachmanides is of the opinion that these occurred in the order in which they appear in the Torah. Thus, G‑d's instructions to Moses regarding the Sanctuary (recounted in Terumah and Tetzaveh) came immediately after the revelation at Sinai, during Moses' first 40 days on the mountain. Their implementation, however, was delayed by Israel's sin and the need for Moses to obtain G‑d's forgiveness and a second pair of Tablets, so that the donation of the materials described in the beginning of Vayak'hel (Exodus 35) occurred on Tishrei 11, the day after Yom Kippur, followed by the Mishkan's construction and erection as per above. Rashi (who follows the Midrash Tanchuma), notes the many Scriptural and Talmudic indications that the Sanctuary was in response to, and an atonement for, the sin of the Golden Calf. Accordingly, Rashi is of the opinion that the divine instructions contained in the sections of Terumah and Tetzaveh were communicated to Moses on Yom Kippur, following Israel's repentance, G‑d's (full) forgiveness, and Moses' receiving of the Second Tablets. A third opinion is that of the Zohar, which states that both G‑d's instructions and Israel's donation of the materials occurred before the sin of the Golden Calf. (Thus, explains the Zohar, the people had to "unload the golden earrings which were in their ears" to provide gold for their idol, since their gold had already been donated for the making of the Mishkan.) According to this, the making of the Sanctuary was not a result of Israel's sin and their repentance thereof, but a mitzvah that was commanded, and begun to be implemented, before the incident of the Golden calf. The Lubavitcher Rebbe points out that these three versions describe three different states of the people commanded and empowered to make an abode for G‑d. According to the Zohar, the commandment to make a Mishkan was directed to a nation of tzaddikim, perfectly righteous individuals untainted by sin or wrongdoing (in accordance with the Talmudic statement that, at Sinai, the people of Israel were born anew, and thus as pure of guilt or an iniquitous past as a newborn infant.) The dedication of the materials of the Mishkan was likewise by tzaddikim. This implies that the making of a physical home for G‑d was possible only because the materials for its construction were dedicated (and thus sanctified) by a people still not tainted by that corruptive use of their gold, and that only such materials could have been fashioned into a home for G‑d. According to Rashi, the commandment to make a Mishkan was directed to baalei teshuvah ("returnees" or "penitents") — individuals who had fallen prey to the corruptions of the material, but had rebounded from their downfall to forge a new, invigorated bond with G‑d. Indeed, the implication is that had the people of Israel not sinned by making and worshipping a calf of gold, there would not have existed the necessity — nor the opportunity — for a physical structure to house the Divine presence in the Israelite camp. The common denominator between these two approaches is that the sin of the Golden Calf did not actually interject (as it does in the text) between the commandment to build the Mishkan and the donation of its materials by the people: according to the Zohar both occurred before Israel's worship of the Golden Calf, and according to Rashi both came afterwards. In other words, both approaches share the notion that the commandment to build the Mishkan would not have "survived" Israel's sin. Indeed, such was the case with the very covenant forged between G‑d and Israel: the Tablets were broken, and a new set had to be hewn and inscribed following the reconciliation of G‑d and Israel. Indeed, there were several marked differences — for the better and for the worse — between the two sets of Tablets. In this lies the uniqueness of Nachmanides' approach, which insists on a "straight" reading of the text and an interpretation of the events that places G‑d's instructions for the making of the Mishkan before the sin of the Golden Calf, and the beginning of their implementation began after the sin and Israel's repentance. According to Nachmanides, the command and empowerment to build a home for G‑d remained in force even as the people worshipped an idol of gold. Unlike the Torah itself (! ), the command to build the Mishkan was not revoked, and no "second edition" was necessary. This means that the ability to make a Sanctuary for G‑d rests also with a nation of resha'im, sinners and transgressors of the divine will! In other words, says the Rebbe, the different interpretations of the Torah's account put forth by the Zohar, Rashi and Nachmanides revolve around the following question: Who can make a "dwelling for G‑d in the physical world"? The perfect tzaddik? The unique personality of the baal teshuvah? Or even the iniquitous rashah? There is an approach that says that only a tzaddik can take lowly objects such as gold, wood or animal hides and transform them into an abode for the divine presence. True, the spiritual tzaddik has no real connection with these materials: the glitter of gold means nothing to him, nor is he moved by the comforts of fine linen or the beauty of artistically woven tapestries. But precisely this is what qualifies him as a builder of a Mishkan. Because he is aloof from the enticements of the material, he can uncover the spiritual potential within the "lowly realm" without being ensnared by its lowliness. This is the approach of the Zohar, which sees the building of the Mishkan as having been possible only with materials donated by the perfectly righteous. A second approach argues that only the baal teshuvah, who has fallen prey to the corruptions of materiality, can truly exploit its divine potential. Only the baal teshuvah knows the material world "from within," having himself been very much a part of it; only the baal teshuvah is a living example of the transformation of lowly into lofty, as one who has exploited the momentum of his fall to attain even greater heights of connection to G‑d. Thus, goes this line of thinking, if Israel had not fallen to the nadir of material corruption by worshipping an idol of gold, the making of a home of gold for G‑d would not have been possible. This is the concept behind Rashi's interpretation, which dates the divine commandment to build the Mishkan on the 10th of Tishrei, following Israel's return to G‑d and the renewed covenant it produced. A third approach rejects the entire concept that making a "dwelling for G‑d in the physical world" requires any particular state or spiritual condition. Is this not the very purpose of G‑d's creation of the world? Is this not the essence of man's mission in life? Man never loses this capacity, for it is integral to his very being. This aspect of the Torah is never revoked or "broken": in whatever situation a person finds himself, even that of a still-unrepentant sinner, he can make his material existence a home for "He who dwells amongst them in the midst of their impurities" (Leviticus 16:16). This is the conception behind Nachmanides' reading of the chapters of the latter half of Exodus, by which the commandment to build the Mishkan remains in force throughout the ups and downs of Israel's relationship with G‑d, even as the rest of the Torah is shattered to pieces. "These and these are the words of the living G‑d" says the Talmud of differing interpretation of Torah by its sages. G‑d's dwelling on earth can, and must be, all three: a home for G‑d built by the pristinely righteous, an abode build by the transformative power of teshuvah, and a divine inhabitation of every human effort to serve Him, no matter how lowly its origin. Indeed, the Rebbe points out, the Ark in the original Mishkan contained the first, broken Tablets as well as the second set. Thus it housed: a) the First Tablets, granted to a nation of tzaddikim; b) these, however, were broken, representing the depths of iniquity to which Israel had descended in the interim; c) the Second Tablets, embodying the power of teshuvah. Thus the divine command to make for G‑d a dwelling out of the materials of physical life is addressed to the tzaddik, to the baal teshuvah and to the rashah. To the tzaddik it says: You are never too holy, too spiritual, too pure, to engage in the task of making Me at home in the lowliest elements of My creation. Indeed, because of your holiness, spirituality and purity, there is a dimension of My home on earth that only you can create for Me. To the baal teshuvah it says: When you agonize your your iniquitous or merely negative past (as you should), remember this: it is that very past that makes you the builder of a most central component of My home on earth. You, and only you, can achieve a true transformation of materiality into G‑dliness. And to the rashah it says: No matter how distant your daily behavior is from My program for life, no matter how it conflicts with My will, when you do a single Mitzvah — a single deed that I have commanded — that part of your physical life shall become an home for My presence. Based on the teachings of the Lubavitcher Rebbe, Rabbi Menachem Mendel Schneerson; adapted by Yanki Tauber. Originally published in Week in Review. Republished with the permission of MeaningfulLife.com. If you wish to republish this article in a periodical, book, or website, please email permissions@meaningfullife.com. Three are more Blissful Three are more blissful! How inspiring! Hoping always we can learn from each other knowledge.